If you’ve ever skipped a workout, there’s a good chance that time had something to do with it. Time is one of our most valuable and limited resources, and something that can seem especially scarce during medical weight loss. On top of your normal responsibilities, you’ll have new diet and exercise habits to follow, and this can make it seem tough to keep up. Exercise is an important element of any weight loss program, but it’s also one of the most frequently forgotten parts of our daily routines. On hectic days, we sometimes put off workout plans to deal with whatever else is on our plates, knowing that we can try again tomorrow. Unfortunately, this can start a cycle that makes exercise a good intention we never truly act upon. Make family fun time physical. Forget family movie night—your weight loss program is the perfect time to encourage the whole household to have some fun with physically-engaging activities. Take your kids to the park to teach them your favorite games, or spend an exciting afternoon walking around the zoo or museum. 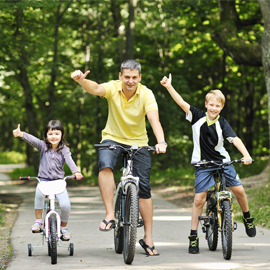 Arrange family bike rides or walks after dinner instead of gathering for TV time. Burn calories en route. In modern times, we sometimes forget that the car isn’t our only way to get around. If you live close enough to your workplace, walking or riding your bike can make your commute much more active. You can also use these forms of transportation to run quick errands—if you bring a basket or a backpack, every trip to the grocery store can also become a great workout. Put some muscle into spring cleaning. To finish chores faster and get some exercise in the process, try upping the pace. Anything from scrubbing the tub to doing the laundry can help you stay active, especially if you do these tasks at a speed that gets your heart pumping. Yard work can also help you break a sweat—raking, digging holes for new plants and investing in a push-reel lawnmower can help you get more out of the time you spend in your yard. It can be a challenge to find time for exercise, but it may help to start looking in a different place. To keep improving your fitness during medical weight loss, try making everyday activities a bit more physical.